Until the early 19th century, it was common for farms to include a family cemetery. Later, as industrialization took over and people moved into towns and cities, family cemeteries were supplanted by larger, centralized municipal cemeteries. The Pardon Gray cemetery, which dates to the 18th century, is an excellent example of a local family burying ground. The cemetery was located behind the Gray family farmhouse, which disappeared long ago. Like many of Tiverton’s early cemeteries, the Pardon Gray cemetery is surrounded by fieldstone walls. Most of the graves include a headstone and a footstone, and they follow the common practice of laying graves east to west, with the footstone on the east and the headstone on the west. The older headstones are black slate, while later ones, from about 1820, are white marble. The exact number of graves within these walls is unknown, since there may have been early, unmarked burials, and some stones may have toppled and been buried beneath soil and overgrowth. The earliest existing grave marker is for Tillinghast Gray, daughter of Pardon and Mary, who died in 1794 at the age of seven months. Nearby is Claracy Cook, the 15-month old daughter of Hannah Gray and Captain George Cook. Colonel Pardon Gray’s grave is in the southwest corner; his wife, Mary, lies beside him. Colonel Gray’s headstone is a modern replacement provided by the Division of Veterans Affairs. A notable headstone (actually two headstones), marks the grave of Deacon Philip Gray who died in 1806. His original headstone is likely the black slate grave marker now leaning against the stone wall. The headstone that currently marks his grave is a later white marble replacement. Research by the Tiverton Land Trust indicates that Philip Gray’s stone was replaced to match his wife Susanna’s headstone. Susanna died much later than Philip, in 1839, and styles had changed. The Pardon Gray cemetery looked very different at the time of acquisition of the property by the Tiverton Land Trust in 2000. It had been ignored for a very long time, and it was extremely overgrown and covered with brambles. The fieldstone walls were in serious disrepair. With support from the Tiverton Historical Cemeteries Commission and private donations, the overgrowth was cleared and the stone walls repaired. In 2012, donations from descendants of Colonel Pardon Gray made it possible to restore the headstones and foot stones into their current configuration. One headstone, which was broken into two pieces, was “glued” together and placed in its proper location. Other headstones that had been buried were uncovered and placed upright in their proper location. 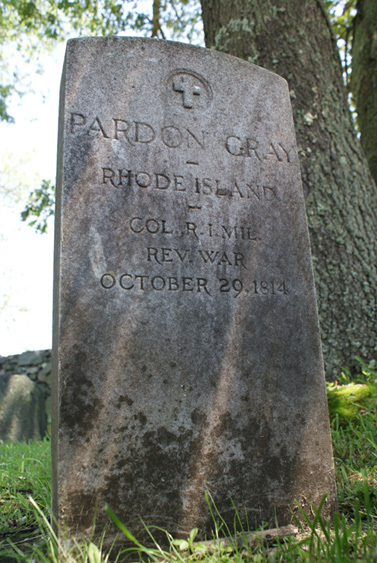 The Pardon Gray Cemetery was designated Tiverton Historical Cemetery #4 by the State of Rhode Island Division of Veterans Affairs during a project to locate and identify historical cemeteries throughout the state. A database of these cemeteries is available through the Rhode Island Historical Cemetery Commission. 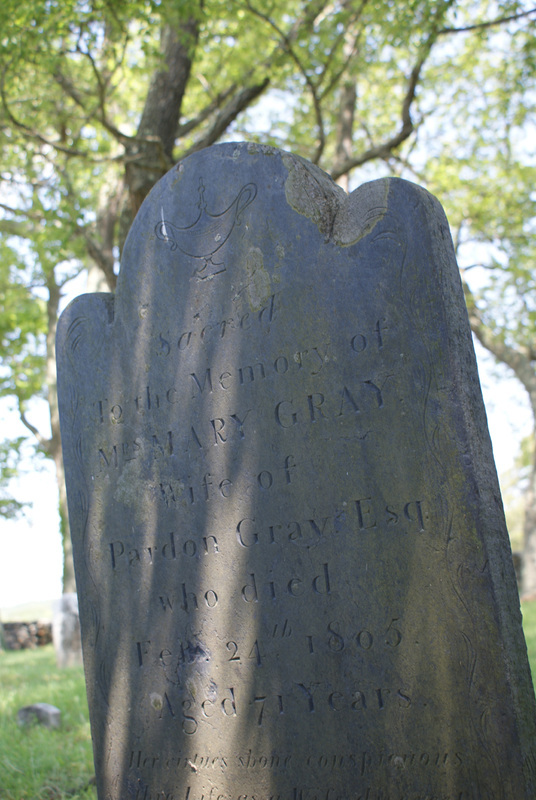 Tiverton Land Trust, “Pardon Gray Cemetery,” Rhode Tour, accessed April 21, 2019, http://rhodetour.org/items/show/130.